For a new website project we need a Logo, Banner and Business cards. The Website ist for homosexual couples who wants to fulfil their dream from having a baby with the help of reproductive medicine. You can use many colours this is no problem, it should give the feeling of something good. 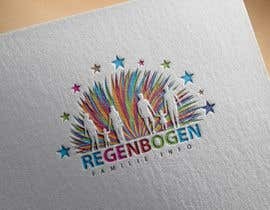 The Logo should include the Text "Regenbogenfamilie"
!!!!! Create us a logo with a firework of colours, make something amazing and outstanding. Nothing Normal, no trees and no hands. It must include a male and a female couple with one or more babies !!!!! Therefore, we need a logo, 2 Banners and business cards that fit the requirements. Before starting, please read about homosexula couples wants to have a child, so you becomean idea what we mean. We need the Logo in different File Formats (EPS, AI, PSD, JPG, PNG, PDF) and in high resolution with 300DPI, best is a vector graphic. The requirements for the two Banner you can find at the attachments, we would deliver the text and the pictures for the banner, also the Logo must appear there. !!!! IMPORTANT: Don´t take a 3D (Only if we can use them also for printing) and take no glossy background only a plain background for the Logo !!!!! !